So, riding in the car with baby/toddler is not always the easiest of experiences. Unlike a lot of NYC dwellers, we actually are in the car quite often. Our recent road trip to Saratoga (a 3+hour ride) made me realize some things that were downright essential! 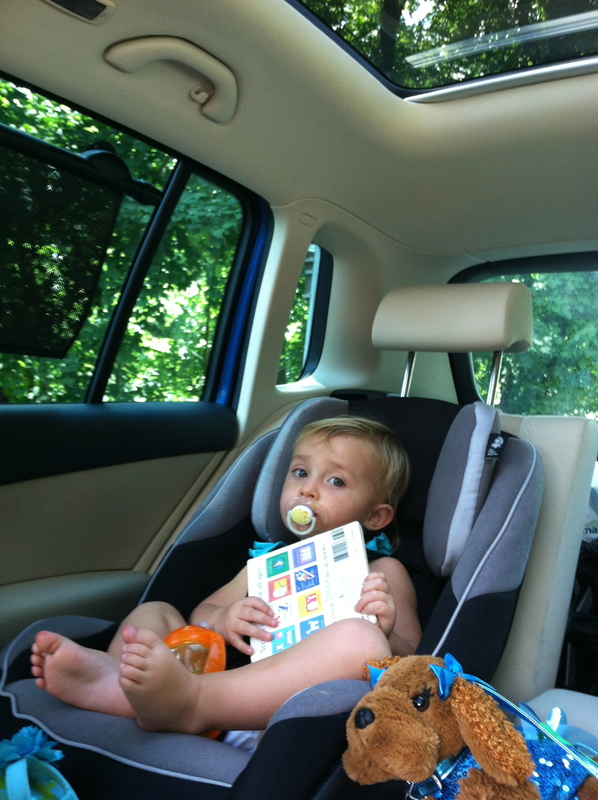 1) The Perfect Car Seat: Ok, so there may not be a perfect seat, but some are better than others. For our infant car seat, I went with the Graco Snug Ride. It is safe, lightweight, versatile (fits in the snap and go travel system which is key for travel) and has an adjustable shade (essential). I didn’t like it’s infant insert, and definitely recommend buying one like this to keep baby snug and comfortable. When it was time, we also bought Aria a convertible (front facing) seat. She actually has a couple different ones but by far her favorite is the Britax she has in Oma’s car. It’s extra cushy and she sits higher which allows her to see out the window better. 2) Window shades: I can’t tell you how essential these are to keep the sun out of the baby’s eyes and off baby’s face. UV rays can still filter through window so these shades protect and keep your baby comfortable. I first bought the White Hot Safety Shade by Munchkin, but they totally don’t stick well or cover as much window area as my second (and much better) purchase by Safety1st. 3) A Mirror (when still rear facing): A mirror allows you to look into your rear view and see you little one’s face. Some argue it can be a distraction, but I think a quick glance is much better than trying to bend behind the seat to check in on baby. 4) Tunes: Baby’s love music. One mom friend gave me a baby’s CD as a gift and said it’s “like crack”, meaning her baby was totally addicted and instantly gratified. Aria too chills out when her tunes get on (not to mention now she asks for “Muffin Man” the second she gets in the car). My mom gave me CD of baby songs early on and I was like, “hells no, we’re not listening to that all trip,” but that quickly changed when I realized Hickory, Dickory, Dock is much better than a screaming baby. 5) Entertainment: Small books, stuffed animals and even soft little dangling toys for infants do make a difference. Now that Aria’s a toddler (and obsessed with Barney) I’ve also been guilty of passing back the iPhone when super desperate for a peaceful ride. 6) Snacks: Again, some people would say this was a big no no (choking hazards), but, if you choose the right snacks (bottles, pureed fruit pouches, puffs that dissolve in their mouth, etc), I can attest that it makes for a much easier time. 7) Pacifier: Again, a “love em or hate em” for many parents. For us they’re a lifesaver quite often (and I’ve cursed myself the times I’ve realized I’ve left the house without one). Aria def prefers Avent.